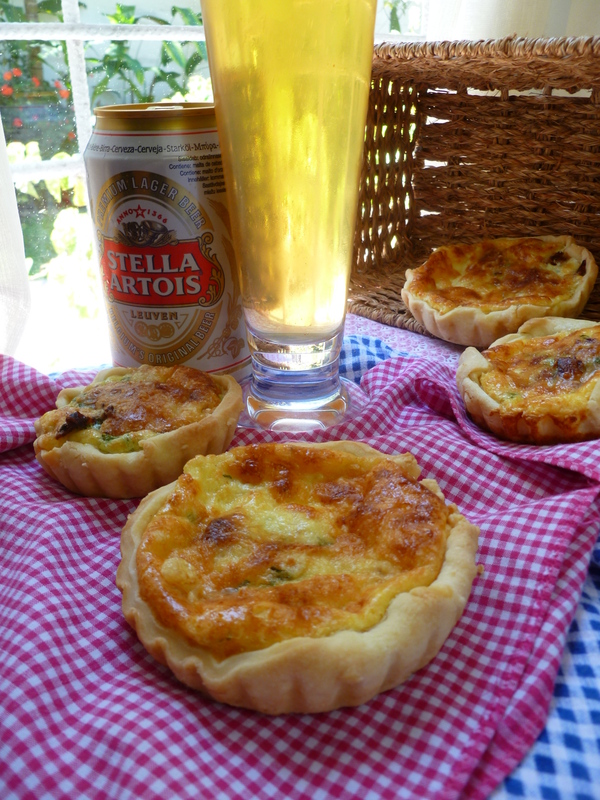 Tarts–small or large–are excellent picnic food. They do not have to be hot to be good. 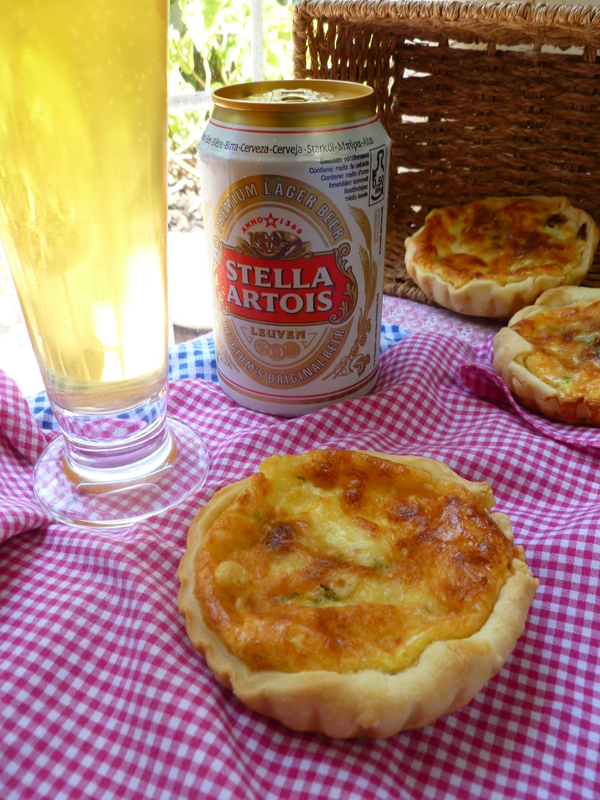 Moreover, the idea of pies in a basket, eaten outdoors, is appealing. The filling in these little tarts is not traditionally Swiss–but the way of making them is. 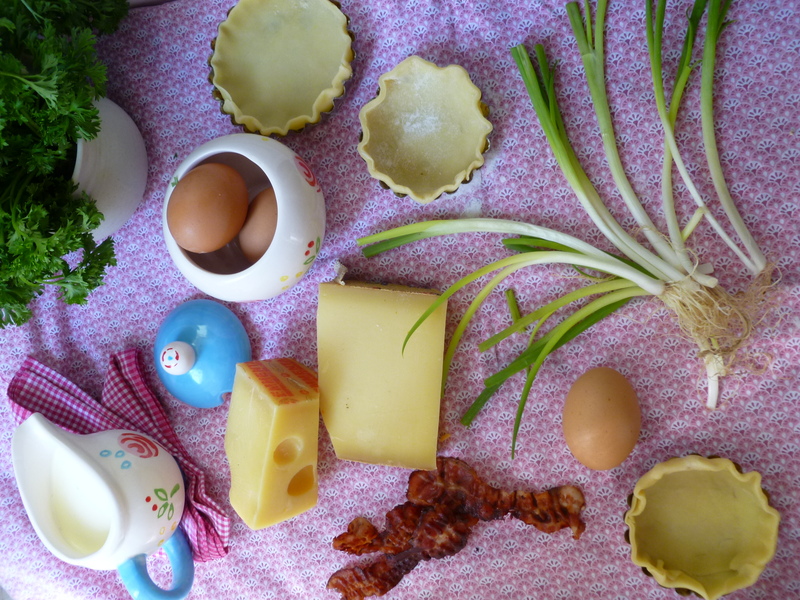 Like traditional Cheese Tarts ~ Swiss Style (described here in an earlier diplomatickitchen post), these tarts of bacon, Gruyère and green onion are the antithesis of quiche. 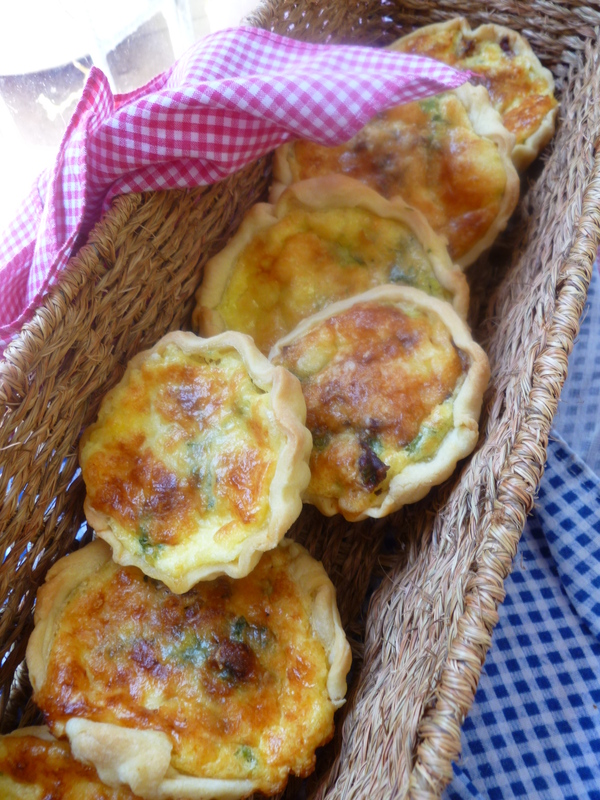 A quiche emphasizes the custard, whereas, a tart made in the Swiss manner focuses on the cheese and, by extension, whatever else goes into the filling before the cream and eggs are poured over it. A Note about the quantity: Maufacturers of small tart tins seem determined to express their individuality by making their tins in a range of mismatched sizes. 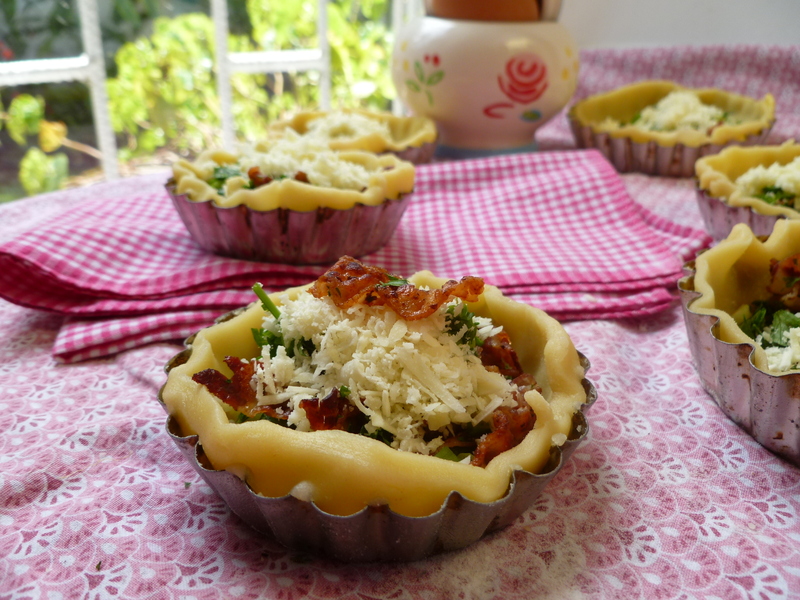 The actual number of tarts the recipe makes will depend on the size of the tins used. In any case, it will probably make more than a dozen. This is all to the good since the hours of a picnic are as variable as its menu–and picnic-ers might come back to the basket for more in the course of a long, relaxing afternoon outside. II. Ingredients for Pastry: Frozen puff pastry is another option, used in place of this shortcrust dough and in the same way as described in the diplomatickitchen post Cheese Tarts ~ Swiss style. 1. Place the flour and salt in the food processor. Add the pieces of butter and pulse until the butter is combined well with the flour. 2. Turn the processor on again and, as it runs, add the cold water by Tablespoons. The mixture will pull away from the sides and form a ball when enough water has been added. 6 Tablespoons will probably be enough. The pastry dough should just hold together, and it shouldn’t be sticky. 3. Divide the pastry into 2 balls, wrap them in waxed paper and refrigerate them for about a half-hour. The purpose of dividing the dough is to make the pastry easier to roll out and cut into circles for the tart tins. 1. Fry the bacon, drain and cool it and chop it coarsely. There should be about 1 cup. Also, coarsely chop both the white and green parts of the green onion. There should be about a cup of them also. Chop enough parsley to measure about 2/3 cup. Mix the bacon, green onion, and parsley together in a bowl and set the mixture aside. 2. In another bowl, beat the eggs. Mix in the heavy cream and, with the mixer still on, add the flour in a stream. 3. Add the milk, and some freshly ground black pepper, salt and nutmeg. 1. Preheat the oven to 400 F and butter the tart pans very well. 3. Place a tart pan upside down on the pastry and cut around it with a knife. The rounds should be bigger than the mouth of the pan, so that the edge of the pastry is a little higher than the rim of the tart pan when it is fitted into it. Liquid is then less likely to spill down into the pan and the tarts will unmould more easily. 4. Fit the pastry rounds into the pans. The pastry doesn’t need to be pressed in tightly. 5. When you have finished cutting out as many circles as possible from the first half of the dough, roll out the second half and continue cutting out pastry rounds from it. Gather up the scraps from both halves and roll them out to make more tarts, or freeze any leftover dough to use another day. …and pour some egg and cream mixture slowly into each shell, letting it trickle down through the filling to fill in the empty spaces. The exact amount poured into each shell isn’t important–divide it among the shells with relative equality without spilling it over the edges of the pastry. The liquid will not completely cover the filling. 8. Bake the tarts for about 20 – 25 minutes, or until they are puffed and golden. The tarts are easiest to unmould while they are still hot, using the pointed tip of a sharp knife to gently pry them away from the tins. Cool them on racks and refrigerate them. They are very good cold, as well as at room temperature. 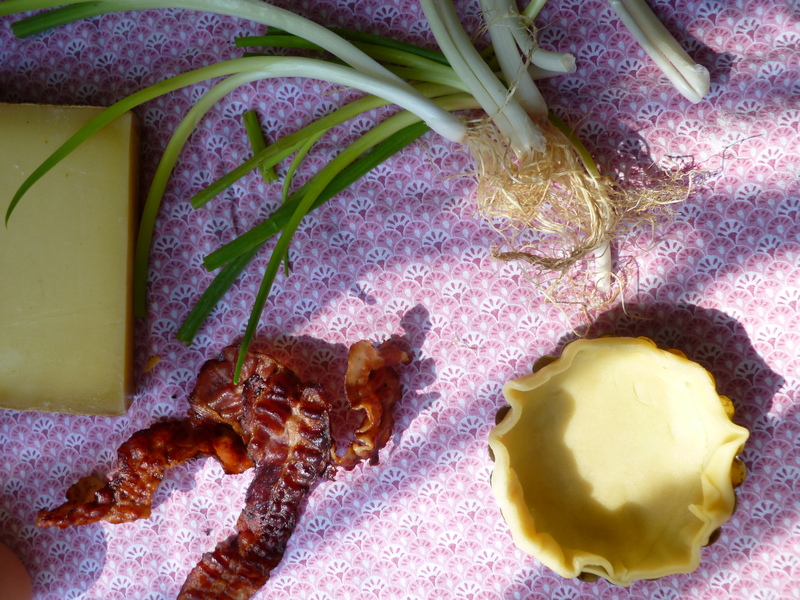 A Note: Bacon, Gruyère and Green Onion Tarts ~ Swiss style are included in the basket of the Occasional Menu: Into the Picnic Basket. With soup, a salad, or both, these small tarts become a Light Lunch…They’re also good for Breakfast and Brunch. 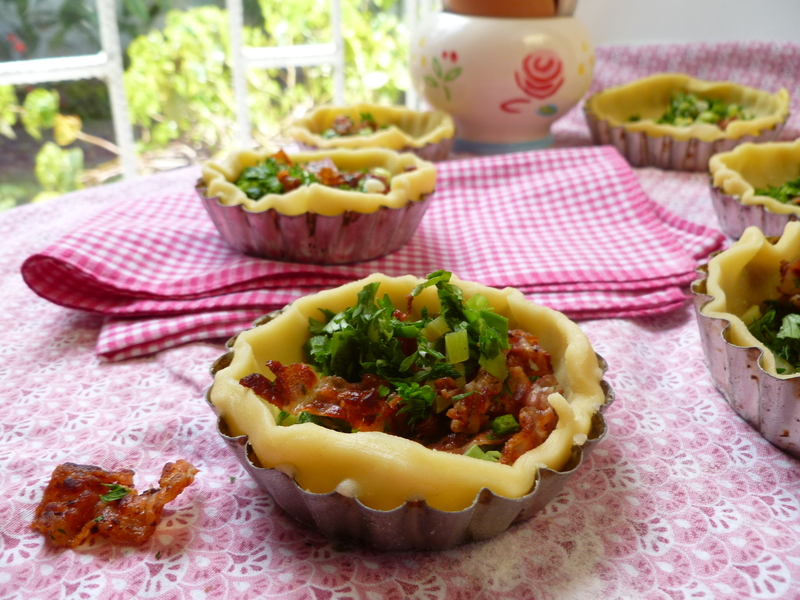 An Acknowledgement: The diplomatickitchen would like to thank the blog Tartelette for the crust recipe and for the idea of putting bacon, green onions and parsley in little tarts.